The Dotz Par from American DJ is a high-powered 3-color LED PAR designed to produce color washes with high-output and smooth color-mixing without RGB shadows, for theater stages, clubs, retail stores, or churches. 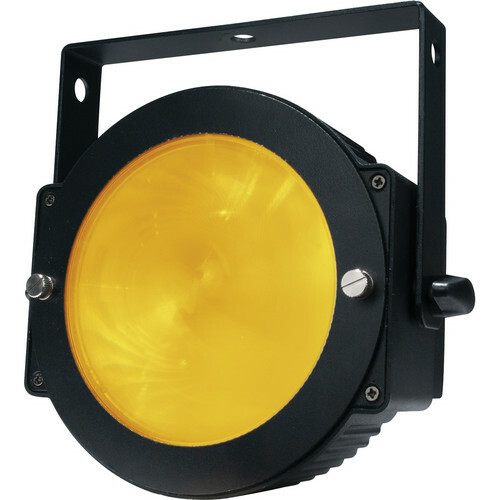 The unit features COB (Chip On Board) technology allowing the 36W LED to fit in the compact and low-profile (4.5"deep) enclosure – ideal for use in applications where space is limited. Furthermore, the DMX connectors are oriented sideways so the unit can be set flat on the ground or inside a truss. The Dotz Par gives you many creative options while still being easy to use. It offers automated programs such as Sound-Active, Auto-Run, Color Macro, Pulse & Strobe for fast setup, and DMX mode for in-depth control. The master/slave option lets you coordinate multiple fixtures without the need for a controller. Other features include flicker-free operation (ideal when used for video applications), 32 built-in color macros, and an auto-sensing power supply. You can also daisy-chain power for up to 13 fixtures (at 110V). The unit comes equipped with a single-yoke bracket that provides the head with a range of motion, and a lens kit to convert the 60° beam down to 25°. It is compatible with the ADJ Dotz Par RF remote control (available separately). Box Dimensions (LxWxH) 11.0 x 9.5 x 6.8"